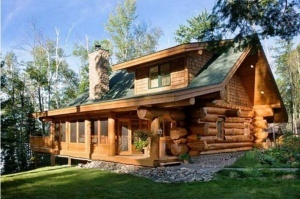 Wild log houses didn’t lose their popularity but in the contrary- they became very popular nowadays. 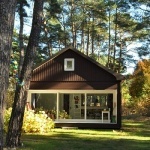 These constructions have vivid advantages and the original appearance. The house which was built from the log by the company Karpaty-Dom may become the cozy ancestral home for a long period of time. The technology requires manual labor on the every phase of work which makes the house secure. The quality is also high which is not so when one uses the mechanic proceeding. 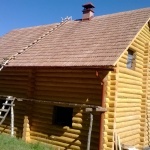 We have different projects of the wooden houses and churches, houses from the wild log of any complexity and design. The prevailing material is transcarpathian “pichta”(fir tree). Modern building technologies enable the purchaser to move into a new house right after the house assembling. 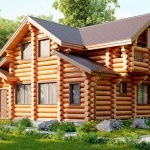 It is better to build wild log houses from the wood which was cut down in winter. We choose logs only the appropriate diameter. 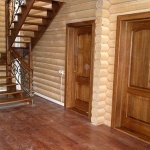 Each tree trunk is polished and treated carefully without any technical interventions. In accordance to the project documentation we cut slots for the future locks for the secure connection of the logs. We use only natural sealant for the thermal isolation. Manual labor makes the house more attractive. The price of such construction is higher than the price of the regularized round timber or laminated veneer lumber. Experienced carpenters of our company and talented project designers will make an exclusive project and an excellent house for you. We guarantee that the life there will be comfortable and healthy. Contact us!